French bulldogs or most commonly and fondly called as Frenchies are fun-loving dogs that are perfect as companions. In fact, French bulldogs are very wonderful as playmates of kids and adults, alike. Frenchies really do thrive on contact with human beings. Moreover, French Bulldogs really love being put at the center of attention. Taking all these into consideration, if you are the type of dog owner that loves clingy dogs then getting a French bulldog may be a good idea. Along with that, you also have to consider what his needs are, most specially the nutritional ones. That said, here in this article, I’ve put up a buying guide plus 2018’s best dog food for French bulldogs. From the name itself, this dog food contains reduced fat and as a result, helps in maintaining healthy weight. This dry dog only contains some of the most premium and all-natural ingredients. It does not contain any grains, is very rich in protein and low in fats. It mainly gathers its nutrient content from turkey and salmon oil. This helps you and your dog manage his or her weight. More than just this, it also contains vitamins such as vitamin B-12 supplement and minerals like calcium. Moreover, this dog food also contains the essential omega fatty acids which help in ensuring your dog’s coat will stay shiny and healthy. One of the sure ways you can do to ensure that your dog will be getting healthy nutrients is to provide him with an organic formula. It contains 32% percent protein and mostly gets it from an all-natural and organic chicken. It contains no content of grains, soy or wheat which may all trigger an allergic reaction from your Frenchie. Moreover, this adult dog food features only organic peas, organic lentils, and organic potatoes. It also contains a healthy amount of fiber which may help in solving your dog’s farting problem. 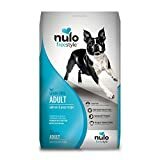 The Nulo Freestyle dog food contains some of the highest content of protein. It has about 80-84 percent based protein. 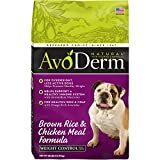 This dog food also contains an all-natural formula and is free from any ingredients that may trigger an allergic reaction such as corn, wheat or grains. It also primarily uses salmon as its main ingredient and contains no chicken which makes this a really good choice for those that may be allergic to chicken. Its formula also contains a relatively lower amount of carbs making it helpful in maintaining healthy weight. This dog food also contains good sources of omega fatty acids which aid in promoting healthy hair and coat. The Avoderm Dog Food is most especially formulated and designed for overweight dogs and the much less active ones. It is designed to help maintain the weight of your dog. It contains 25% less fat that ensures your dog a healthy weight. This dog food also contains an all-natural formula and only contains premium ingredients. Moreover, this dog food also contains avocado oil that is super rich in omega fatty acids which helps to promote healthy hair and coat. Two of the main ingredient of this dog food is brown rice and chicken meal. This means this food is also rich in fiber which is good for solving Frenchie’s farting problem. Considering that Frenchies may be prone to hypothyroidism, the Premium Edge Dry Dog Food may be a really good fit for your own Frenchie. This dry dog food is really designed to help dogs maintain their weight. It contains some of the best quality protein that comes from organic sources. These include potato protein, chicken meal, egg product and chicken. Most of these protein content comes from actual muscle meat making it a good and efficient protein-rich dog food. Moreover, this dog food is not just rich in protein but also in vegetables and fruits such as blueberries. This one also contains L-carnitine which helps in promoting fast and healthy metabolism among dogs. The nutritional necessities of a toy breed dog may be categorized into different sections. More than just that, it can also differ from one particular Frenchie to another. Typically, the recommended number is around one to one and a half cup of dry dog food of high quality. However, one’s particular need will still majorly depend on factors such as level of activity, age, size and metabolism. First, let’s talk about one of the most essential macro nutrients that any dog needs which is calorie. A study done by National Research Council of the National Academies has shown that an average dog weighing over 25 pounds will need about an average calorie intake of 780 calories. Do take note, however, that Frenchies who are older or have been neutered will generally require a slightly bigger amount of calories than the usual. Take also into consideration that the younger they are, the more they can consume calories at a faster pace. This is because they are growing. To be specific, if your dog is really tiny or does not move much and is inactive, you should feed him around 25 calories per pound of his bodyweight. However, if he is about average, you should raise it up to 30 calories per body weight. It is a different story for the much larger and more active Frenchies. You can modify it and alter it to match his or her specific needs. But generally, it does not exceed the amount of 35 calories per body weight.Next, let us talk about the size. Smaller dogs actually tend to burn a greater amount of calories per pound rather than dogs of larger sizes. As a result, food that are produced and designed especially for smaller dogs has more nutrients including calories per ounce. Generally, dogs like French bulldogs grow at a much faster rate than larger sized dog breeds. Taking these into consideration, dog food designed for small breeds are usually the perfect fit for Frenchies. These types will contain the necessary nutrients such as protein, vitamins and calories needed for their growth.Take note that once your dog reaches about ninety percent of his full adult size, you can opt to switch to an adult formula. Now, let us move onto the protein. Of course, a dog food of high quality will never be complete without its protein content. Protein is necessary to strengthen the muscles and bones of your dog. Ideally, a good quality dog food should at least contain about 25% of protein in it. As compared to larger sized dogs, they will not be needing that much protein. However, be sure to keep that rule of thumb in mind. Good protein must come from animal protein sources. Beware of fillers as well. Lastly, take note that a selected some may be allergic to chicken. Moving on, let us talk about carbohydrates. Ideally, carbs must really come from good complex sources. Complex carbs usually come from sweet potatoes. You must take note that Frenchies can be prone to a certain number of health complications. In result, be wary of grains such as corn and soy. These are fillers that may pose a problem to their well-being and health. Some Frenchies may also have difficulty chewing them. As compared to other dogs, Frenchies have relatively shorter coat. However, this does not mean that they do not need fats. Still, they will be needing fats that contain and are also rich in omega fatty acids. It may not be as crucial, but without fats, your Frenchie may develop dry hair or coat. From the name itself, this health condition is something that concerns your dog’s thyroid glands. This condition prevents their gland from producing or making enough hormone. This health problem is very common among Frenchies. In result, they can gain weight super easily. One possible solution for this is to balance your dog’s diet by providing him a dog food that is rich in protein and relatively lower in content of carbs. Farting may not be a serious health problem. However, this condition is a sign that what you are feeding him or her contains a heavy amount of low quality dog fillers. These fillers are typically found in commercial dog food. Ideally, you have to opt for more natural and organic dog food and to stay away from corn. You can also choose to add more fiber to your dog’s food. Frenchies are very vulnerable and susceptible to a number of allergies. In fact, maybe even more than human beings. Typically, you have to keep your dog away from grains such as corn. These are the usual fillers used and do not contain the necessary nutrients needed by your dog. You can opt to use the good grains such as barley and oats. Another alternative solution you can do is to just opt for a grain free formula. Just feed your dog with food that is rich in complex carbs and that is low in glycemic, as well, such as sweet potatoes. And the verdict goes to Wellness CORE Dry Dog Reduced Fat Formula. As stated, French bulldogs are prone to hyperthyroidism. In result, they can gain weight really easily. For this reason, the Wellness Dry Dog Food may be a perfect fit considering it has a reduced fat formula. It contains natural and organic ingredients such as real turkey and salmon oil. Moreover, this one also contains good source of complex carbs. It is also formulated with essential fatty acids such as omega 3 and omega 6 which helps in promoting healthy hair.